Burn any photo/video to Blu-ray/DVD/ISO//BDMV folder. 100+ free attractive DVD templates. Have you ever wondered why you cannot transfer a large amount of image, media and video files to DVD? For this purpose, burning data to DVD Disc came into usage. More importantly, if you have an enormous amount of image and video to be burnt into a Disc, you will have to convert image and video files to ISO format. Although both IMG and ISO are of archival forms, ISO format is recognized as an international standard file format that can contain a large number of images and media files in a single file. The ISO files then created can be burnt easily into a DVD. To create these ISO files, we have ISO burners and ISO creators in the market at present. With the help of these software’s, you can create ISO file from folder and convert image or video to ISO that can, in turn, be burnt into a DVD disc. If you are interested in making a new movie or else interested in burning a large amount of data including images and videos, you will require an ISO file extractor. 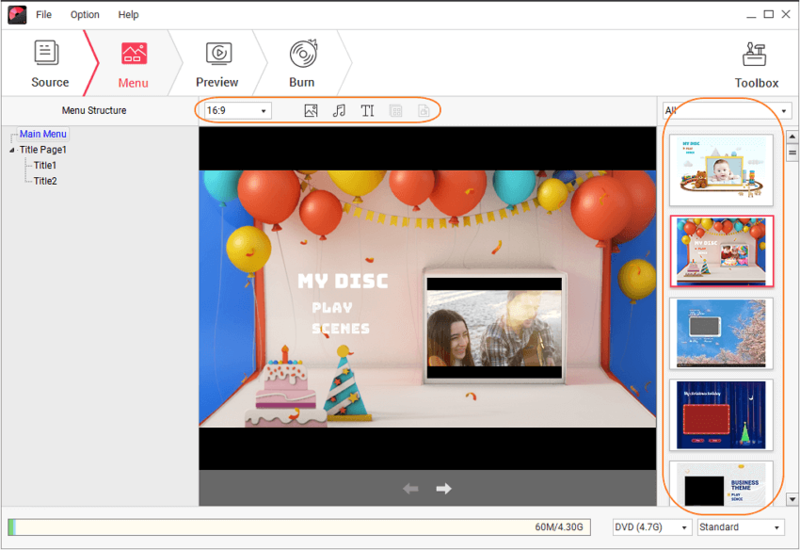 For this purpose, we strongly recommend Wondershare DVD Creator that is now equipped with various functions where you can import your media files, combine your videos and music, slideshow and many more. It allows you to customize your DVD menu and helps in DVD burning. Convert IMG files to ISO/DVD/Blu-ray/BDMV with super fast speed and high-quality output. Built-in editor to edit IMG files easily by applying effects, setting transition, adding text, importing music, and others. Beautify IMG file to DVD menu with 100+ free static and dynamic DVD templates from Memory, Sport to Movie theme. Customize DVD menu further by changing background image/music, adding title/thumbnail, creating chapter and more. Additional toolbox to help with Photo Slideshow, Data Disc, ISO to DVD, DVD to DVD/Video conversion, One-click to burn DVD/Blu-ray Disc, etc. It allows you to create a slideshow by using the images of PNG, JPG, JPEG, and GIF very easily that will be useful for business people and in recalling your memories. There is no disc limitation in burning your data as Wondershare supports mostly all type of Blu-ray discs like BD-25, BD-R AND BD-50. Let's take a look at the steps involved in the creation of ISO file from the IMG format and burning it into a DVD. Launch the Wondershare DVD Creator and select the disc type Create a DVD Video Disc to begin with. You will have to import or drag the images that have to be converted to ISO form. Click the " + " icon under the Source tab to search and add IMG files present on your computer. This process will be continued until you add all the desired images to which you want to create ISO from the folder. All loaded files will display as thumbnails on the left column. Click the pencil-like icon on the thumbnail to edit images, you can enhance each image by adjusting effects, set transition, adding text or background music. This step is optional, you can skip it if you don't want to make any change on your picture. You can customize the images by use of static DVD templates that are available inbuilt in Wondershare. Switch to Menu tab and 100+ template designs will appear on the right column, choose the most suitable one and double-click to apply it. For further customize your ISO menu, hit the icons under the main bar to adjust aspect ratio, change background picture/music, add text and others. Before changing the images to ISO format, move to Preview tab to view your DVD creation. If editing is needed, back to previous options to make the necessary changes. Once all the changes are done and creation is previewed, switch to Burn tab to finish the final step. Select the option Save as ISO on Burn Settings window and choose TV Standard, Disc playback mode, and Folder path. Finally, click Burn button to save a soft copy of ISO file for later use. 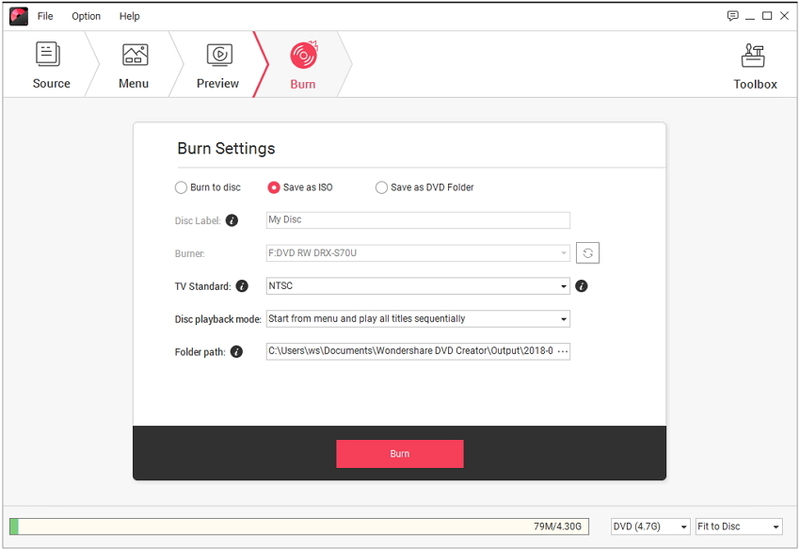 You can also choose Burn to disc option and burn IMG to ISO files immediately. In the last session, we have seen about Wondershare DVD Creator and its implantation in the creation of ISO file. We would like to introduce Wondershare Video Converter Ultimate in this part that burns any type of SD video formats like ASF, MPG, DAT, MP4, MPEG, MOV and more into a DVD. Additionally, you can download, convert, edit, burn and transfer videos. It has fast conversion rate along with high-quality output and has attracted more than 50 million customers by its amazing converting formats. It provides you a Blu-ray experience along with Flawless DVD effects with the help of its DVD toolkit. The interface design is really extraordinary when compared to other video converters and in burning ISO to DVD. The steps involved in burning ISO to DVD are extremely too simple and easy and the implementations are given below. Step 1 Launch and install the Wondershare Video converter ultimate software on your device. Step 2 In the toolbar, click on Burn tab and choose Load ISO Files that have to be burnt. Step 3 you can customize your video in this step before reaching the next step. Step 4 Choose your desired DVD template and add a background to your video. Step 5 Review the DVD settings like aspect ratio, quality and menu type that is available in the drop-down list. Step 6 This is the final step where you can burn ISO file to DVD format. You have to insert the disc to which video is to be burnt. Once, it is completed, click on Burn option and your disc is ready. The term ISO belongs to the origin of ISO 9660 and has an extension of .iso that represents archive file collection of optical disc. ISO files are uncompressed forms of images and videos that can be directly burnt and transferred to DVD, CD. ISO file formats are supported in Window versions. Other popular software used to create ISO files include Freeware folder21SO, ImgBurn, and well-known WinRAR software. They help you to create ISO files from Video and image formats. Below takes creating ISO files for DVD/CD with ImgBurn for your reference. Step 1: Download ImgBurn software and install it. Step 2: Select the images that you wanted to convert to ISO format. Step 3: Now, click on Convert to ISO option to create ISO file. Hope that you find this article helpful to know how you can create ISO files form IMG and burning it to a DVD. Although, there is various software in the market, get to know about them and choose the best one that will fulfill your requirements and makes the process easier. Try out this technique the next time when you have to burn a large data in DVD.